Replacing McFadden's is the new Pass and Stow. It opens up to an outdoor beer garden with dozens of televisions. Longtime Phillies fans will see a familiar sight when they walk up the third-base side of Citizens Bank Park this season: the 19-foot-high Liberty Bell that once hung at Veterans Stadium. After the old stadium was demolished 15 years ago, the iconic steel and aluminum structure ended up in a scrapyard. The team purchased it for $9,000 and refurbished it in time for opening day on March 28. The bell is just one of the new attractions for fans at the Phillies ballpark this season. The refurbished Liberty Bell from Veterans Stadium hanging at Citizens Bank Park. 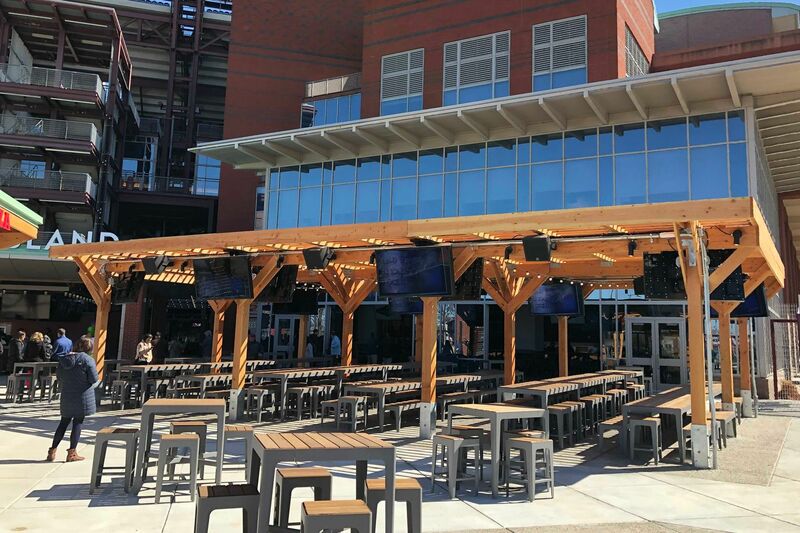 McFadden’s bar has been replaced by Pass and Stow, a combo indoor-outdoor space named after John Pass and John Stow, who recast the original Liberty Bell in 1753. While you could enter McFadden’s without a game ticket, that isn’t the case anymore — Pass and Stow is as much a part of the ballpark as the rest of the concourse. But it will be open two hours before the game starts, so you can enjoy a drink in the new beer garden or at the Goose Island at the Park outdoor bar before first pitch. Goose Island at the Park will be serving locally brewed beers. For those cooler spring nights, you can sit inside at Pass and Stow. Behind the bar is a flipboard made especially for Citizens Bank Park by Oat Foundry, a local company. In an homage to the old sign at 30th Street Station, the flipboard will cycle through with score updates and memorable images from team history. Also available at Pass and Stow: pizza cooked in a brick oven and dozens of televisions so you won’t miss a minute of the action. You can walk right through Pass and Stow and reach the new Shake Shack, located just behind home plate. It’s the first of the chain outpost to have a full sit-down space in a sports venue, according to the team. The space can sit up to 120 people, and you’ll find all your favorites on the menu: ShackBurgers, shakes and fries. Up in Ashburn Alley, fans will have a new spot to take a selfie: a hand-painted mural by PANDR Design Co. on the Budweiser rooftop. The Philly native and front man for the Roots is bringing a vegetarian cheesesteak to the park. It’s made with Impossible 2.0 Meat and topped with cheese sauce and pepper relish. Find it at concession stands behind Sections 108 (in the right-field corner) and 120 (to the left of home plate). Can’t decide between savory and sweet? Get both with a bacon cheeseburger served on a glazed doughnut and topped with spicy pepper jam. Find it at Boardwalk Eats in left field. Cheesy bacon topped tots at Citizens Bank Park. No visit to the ballpark is complete without food served in a helmet. New this year, you can get a generous portion of tater tots topped with cheese sauce and bacon at P.J. Whelihan’s in Ashburn Alley. Tandoori chicken wings at Citizens Bank Park. Among Aramark’s “better-for-you” options, these wings are marinated in yogurt along with chili pepper and tamarind. The lettuce wraps are served with cauliflower and chickpeas. Both items are found at Harry the K’s, below the left-field scoreboard. You can also get the wings at Pass and Stow. The hot chicken sandwich at Citizens Bank Park. A spin on the Nashville classic, the chicken sandwich comes topped with a cooling coleslaw and aioli. The kielbasa is covered in cornichons, mustard seeds and arugula. Both items can be purchased at Pass and Stow. » CONTEST: Can you predict how many home runs Bryce Harper will hit on opening day? When players bid farewell to fans: Are full-page ads and online messages sincere or smart marketing?